How can I find out what DVDs are in the Library? Details of the DVDs held in the Library are held on The Catalogue. You can search for DVDs by entering the search name and then refining the search under 'Collections'. DVDs are interfiled with the book stock on the main shelves. Any accompanying printed material will be shelved with the disc. Need to use a DVD? Where can I view DVDs in the Library? There are student PCs on all floors in the Library that have DVD drives (for region 2 (Europe) DVDs). If you are playing a DVD on a PC/individual player in the Library, you should provide your own headphones. The quality of the DVD I borrowed was so poor I couldn't watch it. What should I do? We are aware that the shelf life of this type of material is not infinite and would appreciate it if you could let a member of staff know if you have difficulty playing a DVD or if the sound or picture quality is poor. We can then attempt to replace the item. Can I borrow DVDs to view at home? 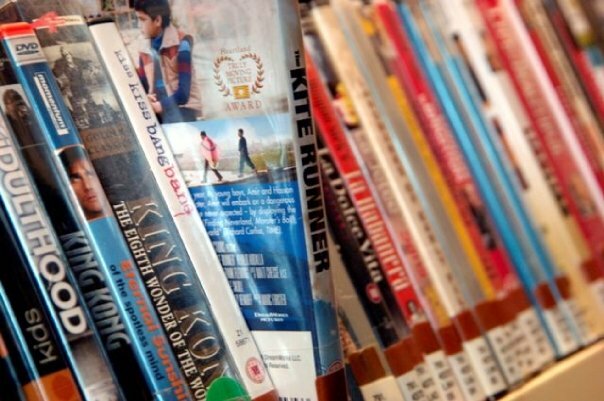 Some DVDs are available for loan - usually for one week, but other items are not available for loan to students and must be viewed in the Library. This is to comply with the terms of the licenses under which we make educational recordings or at the request of the member of teaching staff who has recommended the item. The Catalogue will tell you if an item is loanable or not. Can I copy extracts of a DVD to use in assignments or presentations? You are entitled to copy extracts for use in material submitted for examination, provided that all extracts are correctly acknowledged within the submissions. Any unauthorised use of DVDs, including but not limited to copying, editing, lending, renting, hiring, exhibiting and public performance is strictly prohibited. DVDs remain the copyright of the author and any unauthorised use could result in a breach of the author's rights. Students who wish to film or take photographs in the Library, need to request authorisation to do so by obtaining a signed permission form. The form is available from the link below and all guidelines for filming are included on this form. Please ask at the iZone on the ground floor of the Library to have the form authorised. Off-air TV and radio recordings are a valuable teaching and study aid. We can assist in making these resources available through the recording of programmes, the acquisition of prerecorded items and the storage of material. All University Staff can use the off air recordings service. For further details please see the Helpsheet below.